Yeeeeeehaaaa, can’t believe it, but my new book is out at last! It took a year to research and another year (give or take a month or five) to get it between the covers. I have Dianne Dicks of Bergli Books in Basel to thank – she’s the one who believed in the project, commissioned it and nursed it into being through thick and thin (and there was plenty of both…). 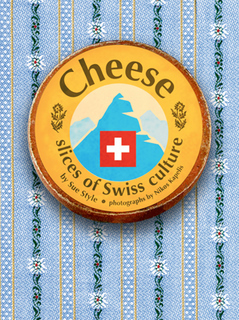 The book has 256 pages and 270 illustrations – a combination of fabulous photos by Nikos Kapelis and reproductions of historical works of art from the Roth Stiftung in Burgdorf, which illustrate the extent to which cheese is intimately linked to Swiss culture. The hardest task was deciding which cheeses to include. According to Switzerland Cheese Marketing, the chief sponsor of the book, there are at least 450 cheeses in Switzerland nowadays; I’ve focused on just 30 or so. In each case, I tell the story of the cheese and the cheese maker: Why this cheese? Why here? Who makes it? How is it made? What makes it special? What does it taste like? The Golden Oldies (Gruyère and Co.) are all there, of course – they seem to go from strength to strength, especially since they obtained AOC (now AOP) status; but there are also loads of new cheeses (softies, goat’s and sheep’s milk, a few blues), which have come into being since the restrictive Swiss Cheese Union was wound up over 10 years ago. If you love cheese (is there anyone out there who does not love cheese?) and you care about artisan products made by people who are passionate about what they do, this is the book for you. There are also 20 recipes, some traditional, some created especially for this book, all illustrated. tks TTV in Tallahassee Florida! a delicious read about a delish product – hope you have good access to some real Swiss cheese in your neck of the woods – maybe something imported by Caroline Hostettler? Congrats!! Caroline Hostettler’s cheeses rule. I always like to see the expression on people’s faces when they ask me what’s my favorite cheese and I tell them Entelbucher Schwingerkase. I tell them I like it because pronouncing the name makes me sound like a character in a Fassbinder movie and that the cheese really rocks the nutty, malty grassy combination that make so many of her cheeses magical. wld love to hear you pronouncing that one – specially with a ripe Luzerner accent! Great name, great cheese – which sadly didn’t make it into the book. Just too many wonderful Swiss farmhouse cheeses to choose from…Enjoy (as I can c u do) ! Have you read this book Sue “Swiss Cheese” by Dominik Flammer? you can get it in English! Hi Fergus – I saw it in German when it came out last year, but haven’t seen the English translation. Two gorgeous books on Swiss cheese within a year – definitely Swiss cheese’s moment!